Background: In the past 10 years, biocellular regenerative medicine has recognized the potential value and availability of a heterogeneous, undifferentiated, nucleated cell population with the adipose tissue complex (ATC). With the recognition of higher mesenchymal stem cell concentrations, ease and safety of access, and the very heterogeneous undifferentiated cell populations in the native 3D adipose matrix, many researchers and clinicians are moving from bone marrow sources to the adipose complex. Approaching the pre-clinical applications from the laboratory state, it is critical to develop an appreciation of the cellular, structural, chemical and paracrine interactions within elements of the stromal vascular fraction (SVF). Further, understanding the importance of platelet-derived growth factors, cytokines, chemokines and adipokines have led clinicians to combine the cell source, native adipose biomatrix (scaffolding), and complex secretory element potential contributions to wound healing and regeneration In vivo. With thousands of clinical experiences in humans in the USA, in vivo, most developing therapeutic modalities are based on clinical outcomes with the majority of reports offering relatively low numbers of cases rather than the longer-term controlled trials often favored. However, with the very high numbers of case reports and small series reporting high safety and efficacy, the results should not be categorically ignored. Content: This paper examines the complex SVF from a cellular, structural, chemical, and mechanical viewpoint. ATC is recognized as the largest endocrine organ in the body which is intrinsically involved in metabolism, immunomodulary activities, and providing an extensive perivascular reservoir of multipotent, undifferentiated cell populations which are involved in homeostasis and regenerative efforts. There is great confusion in use of terms and understanding varied protocols when describing this heterogeneous group of cells and cellular potential functions. 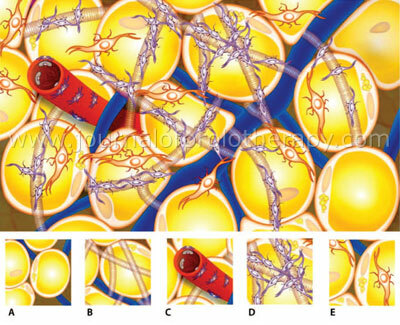 As a huge microvascular bed, adipose appears to provide an ideal pool of undifferentiated cells in close proximity to perivascular access for mobilization and relocation demands of injured or diseased structures. Complex signaling mechanisms exist, the understanding of which is gradually forthcoming through a variety of research modalities and application viewpoints. Comparisons of such studies remain challenging, as standardization of protocols remains elusive. The author attempts to bring an understanding of the interface between clinical experiences and the complex mechanisms in play within various microenvironments within the body as understood at the time of writing. Discussion: Understanding the components of the adipose-derived stromal vascular fraction (AD-SVF) is a key to appreciation of the potential uses and contributions in tissue maintenance and repair. Discussion of the concepts of tolerogenesis and regulatory feedback coupled with realization of the microenvironment importance to cellular proliferation and differentiation is presented. The ability to transfer the intact microenvironmental (“niche”) components within lipoaspirated samples, with no manipulation, is gradually being recognized as a real potential in the clinical setting. There are potential great advantages to use of non-manipulated tissues from the standpoint of repair potentials, as well as the ability to deliver these elements within a “same surgical procedure” within the practice of medicine. Early research activities were aimed at trying to isolate, concentrate and expand the component cellular groups. We currently believe provision of the entire “smorgasbord” of cells and their native scaffolds (extracellular matrix and perivascular structural tissues) may be of greater value than any one component. Letting the individual site dictate the need through complex signaling and paracrine activities, may be more advantageous than total isolation of elements, particularly in the area of many aesthetic, reconstructive, and musculoskeletal applications. There exists great potential in adipose as the primary source of mesenchymal cells and SVF in biocellular therapies of the future. Conclusion: It appears that interaction of the perivascular elements (AD-SVF and bone marrow-derived stromal fraction) and tissue specific conditions are of major importance for organ and total organism function. Tissue repair, homeostasis, and regenerative capabilities must, by nature, be an inseparable interaction resulting in involvement and coordination of the perivascular complex and each microenvironment it supports. The exponential growth of knowledge and interest in understanding the multiple factors involved in human homeostasis and self-repair characteristics is providing information which will potentially alter many of the existing paradigms currently in the practice of medicine and surgery in the coming years. Figure 2. 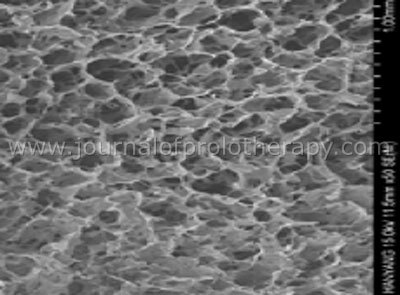 Decellularized, lyophylized native adipose-derived tissue complex (ATC). Attempts to define the ideal use of ATCs have led to appreciation of the myriad of potential effects that can be realized with its use. For example, the In Vivo tolerance of grafting the adipose-platelet concentrate combination proved effective, safe and well tolerated in the clinical setting in thousands of structural autologous fat transplantations aesthetic and reconstructive surgery experiences. Further, appreciating the anti-inflammatory and immunomodulary abilities of such tissues have led researchers to extend uses further into graft versus host modulation with interesting effects. Over the past 7 years in orthopaedic regenerative medicine, the ability to access sterile ATC and provide high-definition ultrasonographic guided adipose tissue transplantation have resulted in the evolution of a recognized clinical procedure of value in a variety of regenerative medical applications, particularly in musculoskeletal and inflammatory disorders.23, 24 Translating from the proven safety and efficacy of encouraging adipogenesis via placement of small aliquot grafting into native subdermal deposit sites, placement into tendon, ligamentous, muscular, joint and pain sites has been a logical course. Based on the commonality of cellular origins, and the proven abilities to differentiate into a variety of mesodermal related cellular types, it is not surprising that the tissues have responded positively to clinical utilization of such cells and bioactive proteins within the transplant recipient sites for healing and regeneration purposes. This can be accomplished without any chemical manipulation, making it available within the United States, whereas “cell assisted” transfers fall outside that classification as defined by the FDA at the time of this writing. The therapeutic rationale for use of these cells and the high content of native multipotent MSCs within the AD-SVF has gained substantial clinical interest. In a very well referenced review and study, Ichim et al (2010) suggested that AD-SVF may offer very important contributions to reduction of inflammation, and favoring re-equilibration of tolergenic mechanisms. Their examples utilized rheumatoid arthritis as a form of autoimmune disorder in which induction tolerance is sought, as well as simultaneous induction of tissue regeneration.27 In addition to ongoing clinical applications and experiential trials, thousands of guided injection therapeutic treatments of adipose-derived stroma and its biomatrix, plus HD PRP concentrates, are being done each year with excellent safety and success. Most of these treatments are reported as case reports, small series or multiple case reports, without ongoing multicentric randomized formats completed at this time. The sheer numbers of experiences, however, cannot be ignored during the translational uses in musculoskeletal cases, particularly as standard protocols are evolving to measure outcomes and commonly accepted metrics. Gathering of all data with comparable metrics and outcomes should be a high priority goal within all organizations performing autologous fat grafting utilization. This review is intended to provide a concise review of the current understanding of the importance and nature of the adipose complex, particularly within its AD-SVF. In most experimental studies, the cellular elements within AD-SVF is extracted and separated by application of protocols similar to or developed by Zuk et al.9, 10 Characterizations of the cell subpopulations constituting the AD-SVF often revolves around the examination of CD 34+ cells, which represent 50-80% of the group. Difficulties in comparative studies typically result from the use of a varied panel of antigens. Hematopoietic components are often studied based on colony-forming assay (CFU-F) for quantification purposes. The endothelial cell fraction is often investigated by quantification of co-expression of several endothelial markers and Ulex europaeus agglutinin 1 (UEA-1) binding. The majority of CD 34+ are found widely distributed among adipose tissues, predominantly associated with vascular and ECM structures. From freshly isolated AD-SVF, the majority of CD 34+ are found to be CD 31–/CD 144–, and easily separated from a distinct population of CD 34+/CD 31–/CD 144– (endothelial cell markers) by differential attachment on uncoated plastic, suggesting that the non-endothelial population occupy a pericytic position. Traktuev et al, analyzed surface and intracellular markers of freshly isolated CD 34+/CD 31–/CD 144– and reported that >90% coexpress CD 10, CD 13, and CD 90, pericytic (chondroitin sulfate proteoglycan, CD 140a and CD 140b), and smooth muscle (alpha-actin, caldesmon, and calponin) markers. In co-culture of AD-SVF cells with human endothelial cells suggested a bi-directional paracrine interaction between these cells.37 (See Figures 3 & 4.) 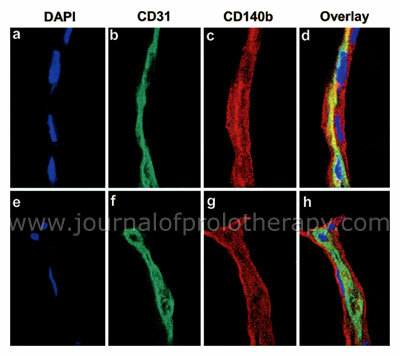 This information suggests that the majority of AD-SVF adherent CD 34+ cells may represent resident pericytes who play a role in vascular stabilization by mutual structural and functional interactions with endothelial cells. Bidirectional paracrine interaction is supported by identification of angiogenic factors (VEGF, HFG, bFGF), inflammatory factors (IL-6 and IL-8, monocyte chemoattractant protein-1 and -2), mobilization factors (macrophage colony-stimulating factor and granulocyte/macrophage colony-stimulating factor) in media conditioned for CD 34+ from adipose-derived stromal cells. Traktuev et al also reported an active and robust mitogenic response when these cells were exposed to basic-FGF, EGF, PDGF-bb. 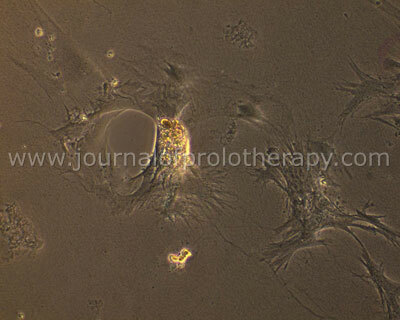 These are prevalent in endothelial cells, plus found in HD PRP concentrate secretion from alpha granules. 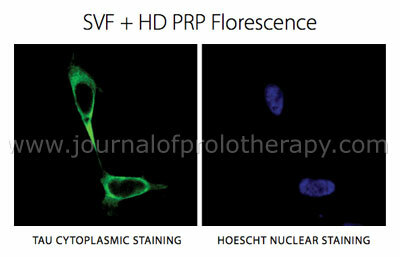 This finding may offer support to the potential advantages offered to the combination of AD-SVF when exposed to HD PRP in autologous tissue transplantations. Figure 5. 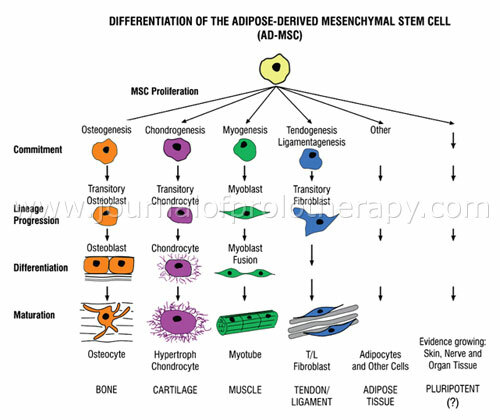 Adipose-Derived Mesenchymal Stromal Cells. Regeneration of diseased or injured tissue from MSCs (as a cell source), coupled with the important anti-inflammatory effects, have been reported in a variety of immune and inflammatory pathologies including MS,57 GVHD (graft versus host responses),58-63 SLE (systemic lupus erythematosis),64 and end-stage liver disease.65 This combination is an important basis for belief that MSCs may play a significant role in reconstructive and regenerative therapies in the future. Defined as CD34+ stem cells of hematopoietic origin, HSCs have been extensively studies for many years, and are being used in clinical therapies. 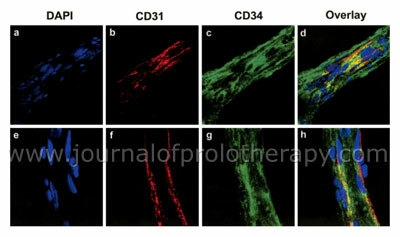 Initially such CD34+ cells were thought to be of prime importance to provide transdifferentiation actions leading to replacement of damaged tissue elements. Researchers now believe that many of the trophic signals and repair may be due to paracrine functions rather than cellular contributions. HSCs have been reported to express many growth factors, including VEFG, HGF, IGF-1, and FGF-2. Besides local changes, an important contribution to angiogenesis (functional collateralization) is considered of significant value. This has led to studies in critical limb ischemia and induced hindlimb models as a therapeutic aid. Activation and proliferation of multipotent cells within the graft and the recipient site seems to work synergistically to produce a regenerative function, while preserving immunologic integrity and providing important anti-inflammatory and associated cellular responses. This appears to be a very important tolerance induction function, which may translate to future applications where cellular regenerative tissue needs can be combined with local area inflammatory controls favoring healing and regenerative activities. As the vasculature is a constantly changing and adapting tissue throughout the body, it seems logical to concentrate stem cells in contact with the SVF would be an ideal distribution interface for rapid response to injury and disease, as well as to maintain homeostatic mechanisms throughout the body. When dealing with biologic tissue changes, understanding the cross-talk (feedback loops) of cell populations, occasional de-differentiation of cells and their physical organization, and coordination within microenvironments may prove very pertinent to regeneration, function, or homeostasis in most or all tissues. An example of this is clear within the adipose tissue complex itself. When fat is grafted from one area of the body and transplanted into an adipose native environment, there is a very strong and direct interaction that favors the transplanted adipocytes, their attached precursor cells,87 and SVF to be directed towards adipogenesis with a strong angiogenic stimulation. When non-manipulated adipose tissues are transplanted into skeletal muscle, ligament, and tendon sites, the adipocytes degenerate while expressing significant signal proteins and growth factors which appear to act upon local resident tissue cells and undifferentiated components from the graft and its SVF elements. This seems to confirm the ability of “site-specific” controls of undifferentiated elements to favor cell lineages needed at the site of damage or disease. This is the basis for the emergence of translational biocellular regenerative therapeutic treatments utilizing adipose-derived stem/stromal cells in the musculoskeletal applications.88 The detailed mechanisms of these changes remain the subject of ongoing clinical trials and laboratory study. Members of the TGF-B superfamily have been implicated in many regulatory functions, and are known to have specific functions within the vascular tissue complex. For example, bone morphogenic proteins (BMPs) are known to support undifferentiated cell renewal,89, 90 favor certain vascular lineage differentiation, and encourage the structural design within the perivascular and vascular elements.91-93 Luo, G et al reported spontaneous calcifications and cartilage formation within arterial walls of matrix Gla protein (MGP) knockout mouse, a known antagonist of BMPs.94 Yao et al also reported AV malformations in the presence of BMPs inhibition via matrix Gla protein. In addition, they demonstrated that inhibition of BMPs provides protection against such calcifications and atherosclerosis.95 The importance of these observations may verify the significant role of the relationships between perivascular tissues and site-specific cell interactions. Understanding these mechanisms is gradually evolving, and may have a critical contribution to optimizing regenerative therapeutic applications. Lander96, 97 effectively described that stem-stromal cells pass through a number of transitory or intermediary steps before reaching terminal differentiation. These cells, during transition, may react to activated growth factors and signal proteins to provide feedback control within the microenvironment. On that basis, it may be that such feedback would serve as both a stem cell control as well as affecting those transitory cells to accelerate more rapid regeneration after injury or disease. Is Stem-Stromal Cell Differentiation Purely a Function of Cell Type? How Does Vasculature Coordinate with Tissue Specific Functions? Yao et al, suggests a potential mechanism in reporting that endothelial cells (EC) and type II lung epithelial cells respond in opposite fashion to the same stimulus.108 In this example, EC proliferation was stimulated by BMP-4 mediated by VEFG, whereas lung epithelial cells were suppressed. When BMP-4 activity was inhibited, the lung epithelial cells were stimulated. They suggested that “reciprocal regulation” was expressed, In vivo, in the balance of airway function and vascularity in the lungs of MGP transgenic mice. Airway formation was found to be dominant in MGP mice, with vascular proliferation dominate in MGP-deficient mice. They concluded that since optimal gas exchange in the lungs are linked directly to the proliferative response of the two different groups of cells, reciprocation of two adjacent cellular types is essential to organ function. The mechanisms responsible for such regulatory functions remain unclear. Reports of importance of these coordinated elements are also found in neurological disturbances. The neurovascular network, coupled with the available undifferentiated cell populations associated with the AD-SVF likely have important contributions to homeostasis and repair of neurological damage or disease. It is possible that perivascular stromal cells and neurons may respond to similar molecular stimuli or may act as a co-regulator of homing to an injury site. Vascular signals such as VEGF and Notch have been reported as important in cellular fate in both the nervous and vascular systems.110 This association may be integral to neurogenesis processes and maintaining/repairing neurological function. Researchers have extensively studied the component elements within AD-SVF In vitro analyses, but recognize the inability to translate from 2D tissue culture conditions and manipulations, to the complex 3-D microenvironments encountered In Vivo. Although important to carefully analyze the isolated behaviors of the undifferentiated cells within the body, gradual beliefs are emerging that, rather than isolate/concentrate for clinical applications, it may be of more value to permit the individual microenvironment to dictate the interactions and utilization. This “smorgasbord” approach to translational therapies is best illustrated by the thousands of guided injections of non-manipulated AD-SVF and bone marrow-derived stromal fraction in musculoskeletal applications. Successes are being reported on case-by-case reporting, pending the extensive controlled clinical trials started or soon to begin. Rather than practitioners attempting to identify the “most” important cell types or paracrine elements needed to accomplish wound repair and tissue regeneration, that leaving those processes to be dictated by diseased or injured sites may be much more effective. At this point in time, extensive research is required to better understand the component parts involved, but replication of the true microenvironments of all tissues In vitro remain somewhat outside our current capabilities or understanding. Use of AD-SVF and its components in biocellular strategies may offer significant potential advantages compared to external medications and/or practitioner selected biological cell treatments. Besides the intrinsic value of the native bioscaffolding within complex adipose tissues, the heterogeneous group of attached cells available for site-specific selection seems to offer great potential in regenerative medicine and surgery. In particular, the MSC components alone offer some substantial contribution abilities such as: a). Local site immune modulation via production of anti-inflammatory factors (TGF-B, HLA-G, IL-10, neuropilan-a ligands and semiphorin-3A113, 114; b). Potential to home to injury sites locally; and, c). Ability to regenerate diseased or injured cells via direct transdifferentiation influenced by local microenvironment cells and a variety of secreted factors. As we are currently in an exponentially growing translational period for use of adult stem/stromal cells, the importance of completing standardization of protocols and clinical studies becomes vastly greater. The scientific understanding supportive of these early clinical uses and observations is rapidly evolving. Large sample, controlled clinical trials are essential to establish the true potential of adult adipose-derived stem-stromal cells. At the time of this writing, more than 80 such studies are underway or in the recruitment phase. (www.clinicaltrials.gov: Keywords – Adipose Stromal Vascular Fraction; Mesenchymal Stem Cells; Adipose Stem Cells; Adult Stem Cells Stromal Vascular Fraction; Adult Stem Cells). There appears to be an inseparable coordination between tissue-specific elements and the supportive AD-SVF and vascular components. Although the details of this complex process remains incompletely understood, such a relationship appears essential to normal organ and tissue homeostasis and repair mechanisms In vivo. The interactions and cooperation appear to have significant importance in the development, maintenance, and regeneration abilities of the body. Further, loss of such regulation and cooperation may be intrinsically involved in disease or degenerative processes. A goal in aesthetic, reconstructive, and regenerative patient care is to identify the component parts and identify how undifferentiated cells and AD-SVF can be directed, In vivo, to areas of dysfunction or degeneration, as well as understand our homeostatic mechanisms. This information is essential for us to be able to optimize or promote specific stem cell activity and lineage differentiation processes in future regenerative medical applications. It appears that the interaction of perivascular elements (AD-SVF and BM-SVF) and tissue specific conditions are of major importance for organ and total organism function. Tissue repair, homeostasis, and regenerative capabilities must, by nature, be an inseparable interaction resulting in involvement and coordination of the perivascular complex and each microenvironment it supports. The exponential growth of knowledge and interest in understanding the multiple factors involved in human homeostasis and self-repair characteristics is providing information which will potentially alter many of the existing paradigms currently in the practice of medicine and surgery in the coming years. 1 Rodeheffer M, et al. Identification of while adipocyte progenitor cells in vivo. Cell. (2008)135:240-249. 2 Granneman J, et al. Selective electroporation of adipocytes within adipose tissue. Am J Physiol. (2004)287:574-582. 3 Alexander RW. Liposculpture in the superficial plane: closed syringe system for improvements in fat removal and free fat transfer. Am. Journal Cosmetic Surgery. (1994)Volume 11(2):127-134. 4 Alexander RW. Autologous fat grafts as a mesenchymal stem cell source for use in prolotherapy: a simple technique to acquire lipoaspirants. J Prolotherapy. (2011)3(3):639-647. 5 Abuzeni P, et al. Enhancement of autologous fat transplantation with platelet-rich plasma. Am J Cosmetic Surg. (2001)18(2):59-70. 6 Alexander RW, et al. Platelet-rich plasma (PRP) utilized to promote greater graft volume retention in autologous fat grafting. Am J Cosmetic Surg. (2006)23(4):627-631. 8 Shiffman. Springer, Berlin. (2010)14:87-112. 9 Krishnan L, et al: Potentiation of neovascularization across tissue interfaces by stromal vascular fraction cells is VEGF dependent. IFATS 2011 (Miami) #127. 10 Zuk P, et al. Multilineage cells from human adipose tissue: implications for cell-based therapies. J Tiss Eng.(2001)7(2):211-228. 11 Zuk P, et al. Human adipose tissue is a source of multipotent stem cells. Mol Biol Cell. (2002)13(12):4279-4295. 12 Yoshimura K, et al. In vivo manipulation of stem cells for adipose tissue repair/reconstruction. Regen Med. (2011)6(6):33-41. 13 Suga H, et a. Adipose tissue remodeling under ischemia: death of adipocytes and activation of stem/progenitor cells. 2012, In Submission. 14 Doi K, et al: Cellular origin in adipose tissue remodeling after transplantation. Presentation IFATS 2011 #62, Miami. 15 Spalding KL, et al. Dynamics of fat cell turnover in humans. Nature. (2008)453:783-787. 16 Yoshimura K, et al. Cell-assisted lipotransfer for cosmetic breast augmentation: supportive use of adipose-derived stem/stromal cells. Aesth Plast Surg. (2008)32(1):48-55. 17 Matsumoto D, et al. Cell-assisted lipotransfer: supportive use of human adipose-derived cells for soft tissue augmentation with lipoinjection. Tissue Eng. (2006)12(12):3375-3383. 18 Mandle R, et al. Biosciences Research Laboratory, Cambridge, MA (Personal Communication). 19 Gimble J, et al. Adipose-derived stem cells for regenerative medicine. Circ Res. (2007)100(9):1249-1260. 20 Blaber S, et al. Characterization of secretions from the stromal vascular fraction. IFATS 2011 (Miami), #166. 21 Gimble J, et al. Clinical and pre-clinical translation of cell-based therapies using adipose tissue-derived cells. Stem Cell Res & Ther. (2010)1(2):19-27. 22 Roberts C, et al. The adipose extracellular matrix role on adipose stem cell differentiation. IFATS 2011 Miami (2011) #77. 23 Kern S, et al. Comparative analysis of mesenchymal stem cells from bone marrow, umbilical cord blood or adipose tissue. Stem Cells. (2006)10:1634-1670. 24 Alderman D, et al. Advances in regenerative medicine: high-density platelet-rich plasma and stem cell prolotherapy. Pract Pain Management. (2011)10:58-75. 25 Alexander RW, et al. Autologous fat grafting as a mesenchymal stem cell source and living bioscaffold in patellar tendon tear: case report. Clin J Sports Med. (2011)21:359-361. 26 Alderman D, et al. Advances in regenerative medicine: high denstiy platelet-rich plasma and stem cell prolotherapy. J Prolotherapy. (2011)Oct:49-90. 27 Flynn L, et al. Adipo-inductive decellularized adipose tissue microcarriers for adipose-derived stem cell expansion and injectable cell delivery. IFATS 2011 (Miami) #35. 27 Ichim TE, et al. Autologous stromal vascular fraction cells: a tool for facilitating tolerance in rheumatic disease. Cell Immunol. (2010)264(1):7-17. 32 Alexander RW, et al. Principal Investigator, NEIRB # 11-414 VP-339. Performance characterization of adipose harvest technologies in human subjects. Ongoing 2011. Unpublished Data. 33 Astori G, et al. “In vitro” and multicolor phenotypic characterization of cell subpopulations identified in fresh human adipose tissue stromal vascular fraction and in the derived Mesenchymal stem cells. J Translat Med. (2007)5(55):1-10. 34 Tang W, et al. White fat progenitor cells reside in the adipose vasculature. Science. (2008)322:583-586. 35 Cristancho A, et al. Forming functional fat: a growing understanding of adipocyte differentiation. Nature. (2011)12:722-734. 36 Krishnan L, et al. Quantification of interactions of adipose-derived stromal cells and the microvasculature. IFATS 2011 (Miami) #128. 37 Traktuev DO, et al. A population of multipotent CD 34+ positive adipose stromal cells share pericyte and mesenchymal surface markers, reside in a periendothelial location, and stabilize endothelial networks. Circ Res. (2008)102:77-85. 38 Alderman D, et al. Stem cell prolotherapy in regenerative medicine: background, research and protocols. J of Prolotherapy. (2011)3(3):689-708. 39 Maumus M, et al. Native human adipose stromal cells: localization, morphology, and phenotype. Intl J Obesity. (2011)35(9):1141-1153. 40 Strem B, et a. Multipotential differentiation of adipose-derived stem cells. Keio J Med. (2005)54(3):132-141. 41 Zannettino AC, et al. Multipotential human adipose-derived stromal stem cells exhibit a perivascular phenotype in vitro and in vivo. J Cell Physiol. (2008)214(2):413-421. 42 Hoogduijn MJ, et al. Human heart, spleen, and perirenal fat-derived mesenchymal stem cells have immunomodulary capacities. Stem Cells Dev. (2007)16(4):597-604. 43 Chao KC, et al. Islet-like clusters derived from mesenchymal stem cells in wharton’s jelly of the human umbilical cord for transplantation to control type 1 diabetes. PLoS ONE. (2008)3(1):.e1451. 44 Jo YY, et al. Isolation and characterization of postnatal stem cells from human dental tissues. Tissue Eng. (2007)13(4):767-773. 45 He Q, et al. Concise review: multipotent mesenchymal stromal cells in blood. Stem Cells. (2007)25(1):69-77. 46 Oh W, et al. Immunological properties of umbilical cord blood-derived mesenchymal stromal cells. Cell Immunol. (2008)251(2):116-123. 47 Patel AN, et al. Multipotent menstrual blood stromal stem cells: isolation, characterization, and differentiation. Cell Transplant. (2008)17(3):303-311. 48 Nasef A, et al. Identification of IL-10 and TGF-beta transcripts involved in the inhibition of T-lymphocyte proliferation during cell contact with human mesenchymal stem cells. Gene Expr. (2007)13(4-5):217-126. 49 Ko E, et al. Mesenchymal stem cells inhibit the differentiation of CD 4+ T-cells into interleukin-17 secreting T cells. Acta Haematol. (2008)120(3):165-167. 50 Ryan JM, et al. Interferon-gamma does not break, but promotes the immunosuppressive capacity of adult human mesenchymal stem cells. Clin Exp Immunol. 149(2):353-363. 51 Nasef A, et al. Leukemia inhibitory factor: role in human mesenchymal stem cells mediated immunosuppression. Cell Immunol. (2008)253(1-2):16-22. 52 Selmani Z, et al. Human leukocyte antigen-G5 secretion by human mesenchymal stem cells is required to suppress T lymphocyte and natural killer function and to induce CD 4+ CD 25high FOXP3+ regulatory T cells. Stem Cells. (2008)26(1): 212-222. 53 Ortiz LA, et al. Interleukin 1 receptor antagonist mediates the anti-inflammatory and antifibrotic effect of mesenchymal stem cells during lung injury. Proc Natl Acad Sci USA. (2007)104(26):11002-11007. 54 English K, et al. IFN-gamma and TNF-alpha differentially regulate immunomodulation by murine mesenchymal stem cells. Immunol Lett. (2007)110(2):91-100. 55 Jones BJ. Immunosuppression by placental indoleamine 2,3 dioxygenase: a role for mesenchymal stem cells. Placenta. (2007)28(11-12):1174-1181. 56 Casiraghi F, et al. Pretransplant infusion of mesenchymal stem cells prolongs the survival of a semiallogeneic heart transplant through the generation of regulatory T cells. J Immunol. (2008)181(6):3933-3946. 57 Kassis I, et al. Neuroprotection and immunomodulation with mesenchymal stem cells in chronic experimentation autoimmune encephalomyelitis. Arch Neurol. (2008)65(6):753-761. 58 LeBlanc K, et al. Mesenchymal stem cells ameliorate tissue damages triggered by renal ischemia and reperfusion injury. Lancet. (2008)371(9624):1579-1586. 59 Ning H, et al. The correlation between co-transplantation of mesenchymal stem cells and higher recurrence rate in hematologic malignancy patients: outcome of a pilot clinical study. Leukemia. (2008)22(3):593-599. 60 Ball L, et al. Third party mesenchymal stromal cell infusions fail to induce tissue repair despite successful control of severe grade IV acute graft-versus-host disease in a child with juvenile myelo-monocytic leukemia. Leukemia. 22(6):1256-1257. 61 Ringden O, et al. Mesenchymal stem cells for treatment of therapy-resistant graft-versus-host disease. Transplantation. (2006)81(10):1390-1397. 62 LeBlanc K, et al. Treatment of severe acute graft-versus-host disease with third party haploididentical mesenchymal stem cells. Lancet. (2004)363(9419):1439-1441. 63 Muller I, et al. Application of multipotent mesenchymal stromal cells in pediatric patients following allgeneic stem cell transplantation. Blood Cells Mol Dis. (2008)40(1):25-32. 64 Sun L, et al. Mesenchymal stem cell transplantation reverses multiorgan dysfunction in systemic lupus erythematosis mice and humans. Stem Cells. (2009)27(6):1421-1432. 65 Kharaziha P, et al. Improvement of liver function in liver cirrhosis patients after autologous mesenchymal stem cell injection: a phase I-II clinical trial. Euro J Gastroenterol Hepatol. (2009)21(10):1199-1205. 66 Reisner Y, et al. Tolerance induction by ‘megadose’ transplants of CD 34+ stem cells: a new option for leukemia patients without an HLA-matched donor. Curr Opin Immunol. (2000)12(5):536-531. 67 Gur H, et al. Immune regulatory activity of CD 34+ progenitor cells: evidence for a deletion-based mechanism mediated by TNF-alpha. Blood. (2005)105(6):2585-2593. 68 Wahl SM, et al. TGF-beta: a mobile purveyor of immune privilege. Immunol Rev. (2006)213:213-227. 69 Lewkowicz P, et al. Lipopolysaccharide-activated CD 4+ CD 25+ T regulatory cells inhibit neutrophil function and promote their apoptosis and death. J Immunol. (2006)177(10):7155-7163. 70 Mahajan D, et al. CD4+ CD25+ regulatory T cells protect against injury in an innance murine model of chronic kidney disease. J Am Soc Nephrol. (2006)17(10):2731-2741. 71 Massberg S, et al. Immunosurveillance by hematopoietic progenitor cells trafficking through blood, lymph, and peripheral tissues. Cell. (2007)131(5):994-1008. 72 Feuerer M, et al. Lean, but not obese, fat is enriched for a unique population of regulatory T cells that affect metabolic parameters. Nat. Med. (2009)15(8):930-939. 73 Valencia X, et al. TNF down modulates the function of human CD 4+ CD25high T regulatory cells. Blood. (2006)108(1):253-261. 74 De Rosa V, et al. A key role of leptin in the control of regulatory T cell proliferation. Immunity. (2007)26(2):241-255. 75 Chatenoud L. CD3-specific antibody-induced active tolerance: from bench to bedside. Nat Rev Immunol. (2003)3(2):123-132. 76 Riordan NH, et al. Non-expanded adipose stromal vascular fraction cell therapy for multiple sclerosis. J Translat Med. (2009)7:29. 77 Coleman S. Structural Lipoaugmentation: Safe Liposuction and Fat Transfer. Ed. Narins, New York, Marcel Dekker (2003):409-423. 78 Eto H, et al. Adipose injury-associated factors activate adipose stem/stromal cells, induce neoangiogenesis, and mitigate hypoxia in ischemic tissues. Am J Path. (2011)178(5):2322-2332. 79 Alexander RW. Fat transfer with platelet-rich plasma for breast augmentation. In “Autologous Fat Grafting” Editor: Shiffman. Springer, Berlin (2009)56:453-469. 80 Caplan A. Adult mesenchymal stem cells for tissue engineering versus regenerative medicine. J Cell Physiol. (2007)213:341-347. 81 Traktuev D, et al. A population of multipotent CD 34+ positive adipose stromal cells share pericyte and mesenchymal surface markers, reside in a peri-endothelial location, and stabilize endothelial networks. Circ Res. (2008)102:77-85. 82 Crisan M, et al. A perivascular origin for mesenchymal stem cells in multiple human organs. Cell Stem Cell. (2008)3:301-313. 83 Zimmerlin L, et al. Stromal vascular progenitors in adult human adipose tissue. Cytometry Part A. (2010)77(A):22-30. 84 Sage AP, et al. Regulatory mechanisms in vascular calcification. Nat Rev Cardiol. (2010)7:528-536. 85 Torsney E, et al. Resident vascular progenitor cells. J Mol Cell Cardiol. (2011)50:304-311. 86 Lander AD. The ‘stem cell’ concept: is it holding us back? J Biology. (2009)870. 87 Granneman J. Seeing the trees in the forest: selective electroporation of adipocytes within adipose tissue. Am J Physiol Endocrinol Metab. (2004)287:574-582. 88 Alderman D, et al. Biocellular regenerative medicine in musculoskeletal applications. Pending Pub J Prolotherapy. (March 2012). 89 Watabe T, et al. Roles of TGF-beta family signaling in stem cell renewal and differentiation. Cell Res. (2009)19:103-115. 90 Varga A, et al. The disparate role of BMP in stem cell biology. Oncogene. (2005)24:5713-5721. 91 Lowery J, et al. BMP signaling in vascular development and disease. Cytokine Growth Factor Rev. (2010)21:287-298. 92 David L, et al. Emerging role of bone morphogenetic proteins in angiogenesis. Cytokine Growth Factor Rev. (2009)20:203-212. 93 Yao Y, et al. Matrix GLA protein: an inhibitory morphogen I pulmonary vascular development. J Biol Chem. (2007)282:30131-30142. 94 Luo G, et al. Spontaneous calcification of arteries and cartilage in mice lacking matrix GLS protein. Nature. (1997)386:78-81. 95 Yao Y, et al. Inhibition of bone morphogenetic proteins protects against atherosclerosis and vascular calcification. Circ Res. (2010)107:485-494. 96 Lander A. Pattern, growth, and control. Cell. (2011)144:955-969. 97 Lander A, et al. Cell lineages and the logic of proliferative control. PLos Biol. (2009)7(1):e1000015. 98 Watt F, et al. Out of eden: stem cells and their niches. Science. (2000)287:1427-1430. 99 Shanahan C, et al. Arterial calcification in chronic kidney disease: key roles for calcium and phosphate. Circ Res. (2011)109:697-711. 100 Kuwana M, et al. Human circulating CD 14+ monocytes as a source of progenitors that exhibit mesenchymal cell differentiation. J Leukocyte Biol. (2003)74:833-845. 101 Lymere V, et al. Vascular smooth muscle cell phenotypic plasticity and the regulation of vascular calcification. J Intern Med. (2006)260:192-210. 102 Medici D, et al. Conversion of vascular endothelial cells into multipotent stem-like cells. Nat Med. (2010)16:1400-1406. 103 Garfinkel A, et al. Pattern formation by vascular mesenchymal cells. Proc Natl Acad Sci USA. (2004)101:9247-9250. 104 Zebboudj A, et al. Matrix GLA-protein and BMP-2 regulate osteoinduction in calcifying vascular cells. J Cell Biochem. (2003)90:756-765. 105 Eto H, et al. Adipose injury-associated factors activate adipose stem/stromal cells, induce neoangiogenesis, and mitigate hypoxia in ischemic tissues. Plast Reconstr Surg. (2010)126(6):1911-1923. 106 Kato H, et al. Short and long-term cellular events in adipose tissue remodeling after non-vascularized grafting. IFATS 2011 Miami, #72. 107 Rupnick MA, et al: Adipose tissue mass can be regulated through the vasculature. Proc Natl Acad Sci, USA. (2002)99:10229-10942. 108 Yao Y, et al. Matrix GLA-protein deficiencies causes arteriovenous malformations in mice. J Clin Invest. (2011)121:2993-3004. 109 Lander A, et al. Cell lineages and the logic of proliferative control. PLoS Biol. (2009)7(1):84-100. 110 Feng J, et al. Dual origin of mesenchymal stem cells to organ growth and repair. Proc Natl Acad Sci (USA). (2011)108(16):6503-6508. 111 Alexander RW. Fat transfer with platelet-rich plasma for breast augmentation. In “Autologous Fat Grafting” Ed Shiffman, 2010;33:243-259. 112 Swift M, et al. Arterial-venous specification during development. Circ Res. (2009)104:576-588. 113 Ryan J. Interferon-gamma does not break, but promotes the immunosuppressive capacity of adult human mesenchymal stem cells. Clin Exp Immunol. (2007)149(2):353-363. 114 Nasef A, et al. Leukemia inhibitory factor: role in human mesenchymal stem cells mediated immunosuppression. Cell Immunol. (2008)253(1-2):16-22.